I think it’s fair to say that all of us have at some point suffered from prolonged periods of time where getting a good night’s sleep is nigh on impossible; either we can’t fall asleep, we fall asleep but then wake repeatedly throughout the night, or we fall asleep and wake up at 4am bright eyed until we finally manage to fall back asleep at 7am – a fabulous 15 minutes before our alarm goes off. Just thinking about it depresses me. Getting a good, solid night’s sleep is now more like a miracle for most of us and we’re so excited when it happens we just have to tell everyone else we see before 11am. I’ve had severe bouts of insomnia in the past and as any of you who have experienced this will understand, you basically feel like you’re losing your mind. A few bad nights here and there are ok – you can get through on some sort of adrenaline rush – but when it becomes repetitive it can really interfere with your day to day life: bad sleep simply leads to poorer mental and physical health because it’s during a blissful night of deep sleep that our bodies repair themselves. Waking up on the wrong side of the bed (feeling grumpy, agitated, being unable to make reasonable decisions) really can all be blamed on lack of a good kip. So, with 2016 getting into full swing and so many of us on a path to a healthier, happier year of self-improvement, I have been on a quest to find out what we can do to help us get some much deserved rest and wake up full of energy. We hear this time and time again but I can’t stress enough the importance of truly unwinding in the evenings. It’s so easy to get caught up in our jobs, families, and relationships: we’re checking our e-mails as we step out of the shower and browsing through Facebook while we cook dinner. By the time you’re ready to actually get into bed you haven’t had a minute to yourself and your mind is still racing while it processes all the thoughts and emotions from the day making it all the more difficult to switch off and fall into sleep. I am guilty of this and I’ve recently realised just how damaging it is, not just for our sleep but our overall mental and emotional well being. So my advice is to turn off your phone at least 2 hours before bed – you will be shocked by what a difference it makes to your life and to how much more time you have when you’re not constantly checking your phone. Engage in an activity for at least 30 minutes before bed time that will distract you from your thoughts and allow you to be mindful in the moment. Whether this is reading a book you’ve been meaning to read for ages, catching up on your favourite series or listening to a podcast – make some time for YOU, where you don’t need to do anything for anyone else… You deserve it. Growing up, you’re either in a household of ‘shower timers’ or ‘bath timers’, and I was definitely in the shower group. I never had baths and always thought they seemed like a nice idea but in reality they were just a little dull and took up way too much time. Now, however, I am a bath addict. Having a HOT bath and soaking in it for twenty minutes is such a great way to get your body ready for sleep: it is a perfect time to relax your mind with no distractions, and Epsom salts and bath oils should be your new bath time buddies. Epsom salts are brilliant for releasing muscle tension and drawing out toxins from the body – I add about half a cup in my bath while it’s filling up. Once your bath is filled you can now add all your favourite essential oils – I love using eucalyptus and lavender. The luscious smells from these oils will completely relax you and you’re sure to be feeling ready to doze off after. Creating a routine for your bed time is vital for allowing your body to prepare for sleep. A consistent sleep pattern where you aim to go to bed and wake up at a similar time each day will help your body to set it’s own internal clock, too. While this is relatively easy to do on weekdays, our weekends can completely mess it up: a Sunday morning lie-in is essentially giving our bodies a dose of jet-lag, which is why we struggle so much to get up early on a Monday morning. Getting out of bed a little closer to your usual wake up time on a weekend will help your body keep to a more regulated sleep pattern, meaning that falling asleep and waking up on weekdays should be that much easier. Another reason our sleep gets so messed up on the weekends? That’d be alcohol. Contrary to popular belief, while we might initially feel like we fall into a deep sleep after a few drinks, we actually fail to get the ‘proper’ sleep we need and often the sugar in the alcohol will keep waking us up throughout the night. During the cold winter months we tend to get home and put the heating on full blast. If your household is anything like mine, you will have the same argument over and over again with your boyfriend about why you need the house to be so hot (but not before he slyly makes his way to the thermostat to turn it off). And as much as it saddens me to say this, in this case, the boys are right. Keeping cool (18 degrees Celsius is the optimum temperature, FYI) is actually one easy way to improve your sleep. Too hot or too cold, and your sleep will be disrupted and you will find it much harder to fall asleep. I have succumbed to being wrong and I’m surprisingly thankful I did – I really do sleep much better in a cooler room. If you’ve got kids then you’ll know that a dark and silent room is a must if you’re going to have any hope of them (and you) sleeping through the night. Living in a city makes this pretty much impossible thanks to the never ending street lights and constant noise, so unless you’re investing in black out blinds and sound proof walls then it can be hard to achieve this serene vision of your sleeping environment. The easy solution is a comfortable eye mask and some ear plugs! 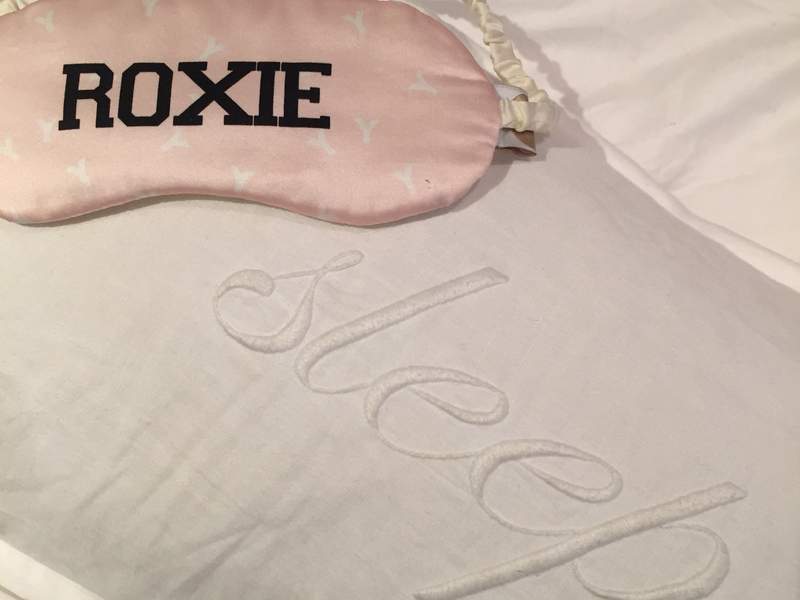 Not only does an eye mask make you feel like a Hollywood movie star but it’s also a great way to avoid the distraction of light from appliances (because let’s be honest how many of us ACTUALLY turn them off at the socket every night?). I’m obsessed with wearing my ear plugs because I feel like I’m in a void and it instantly relaxes me – I go for disposable ones though because I inevitably lose them in the middle of the night and somehow they turn up at the other side of the bed by morning. I never stop talking about how important drinking enough water is – I truly believe that you can’t start any health/beauty regime without being fully hydrated and I encourage anyone who wants to feel a million times better in themselves to drink at least 2-3 litres a day. However, drinking a lot of water also means that you need to make loo breaks an annoying amount of times, and this doesn’t stop when you fall asleep. I try to stop drinking too much liquid around 2 hours before bed times to avoid waking up throughout the night and disrupting my sleep. I mentioned lavender earlier and I’m mentioning it again now because it is SUCH an amazing sleep aid. Think of lavender as your new BFF. I’m obsessed with ‘This Works Sleep + Pillow Spray’. It has a gradual release so not only does it help you fall asleep, it helps to maintain a healthy sleep too – it’s my miracle sleep product. I hope this has inspired some of your evenings and you enjoy getting cosy and comfortable tonight. Can’t wait to hear some of your suggestions too. Sweet Dreams!